Blast your way through enemy lines as you fight to destroy Axis forces before they get you. This exciting arcade challenge will keep you entertained for hours. Keep your eyes open for armor-piercing missiles as you urge your tank forward into one of the toughest battles of WW2. The action is fast as more and more enemies join the fight with every yard of ground you gain. You have to be quick, accurate, and bold to survive, but you must get through! Explosive sounds of battle compete with pulse-pounding music to hype you for 10 levels of addictive game play. Gain life bonuses and power-ups as you destroy the enemy army. You have a bird's-eye perspective of the buildings, vehicles and soldiers that challenge your advance, so you know what lies just ahead. Download free full version game today and begin this online adventure now! The world depends on you. 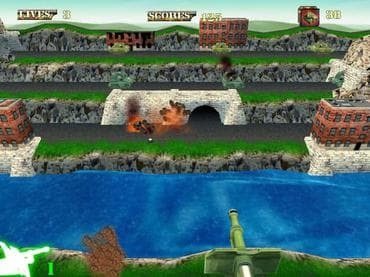 If you have questions about Tank Assault game, please contact us using this form.